A mystery/comedy series about Adrian Monk (Tony Shalhoub), an obsessive-compulsive detective. Monk suffers from a psychological disorder that cost him his position as a legendary homicide detective on the San Francisco police force. 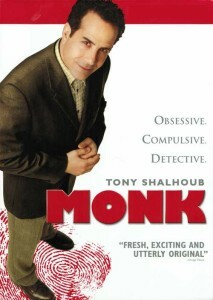 Due to the tragic unsolved murder of his wife, Monk has developed an abnormal fear of germs, heights, crowds and virtually everything else — which provides an unusual challenge to solving crimes but possibly enhances his brilliant insight to the crimes, making him an invaluable consultant to the police force which he once served. Starring: Tony Shalhoub, Jason Gray-Stanford, Ted Levine.